Today I’m thrilled to have Alisa Meredith on the show. Alisa is the content marketing manager over at Tailwind and she’s a Pinterest expert. Now Pinterest is one of my top social media traffic sources but over the past year or so, Pinterest has made a bunch of changes to their ranking algorithms. So I asked Alisa to come on the show today to talk about what’s working today in Pinterest land. You’re listening to the My Wife Quit Her Job Podcast, the place where I bring on successful bootstrapped business owners and delve deeply into what strategies are working and what strategies are not in business. Now today I’m happy to have Alisa Meredith on the show. And Alisa is the content marketing manager over at Tailwind which is one of the premier tools that business owners use for Pinterest. 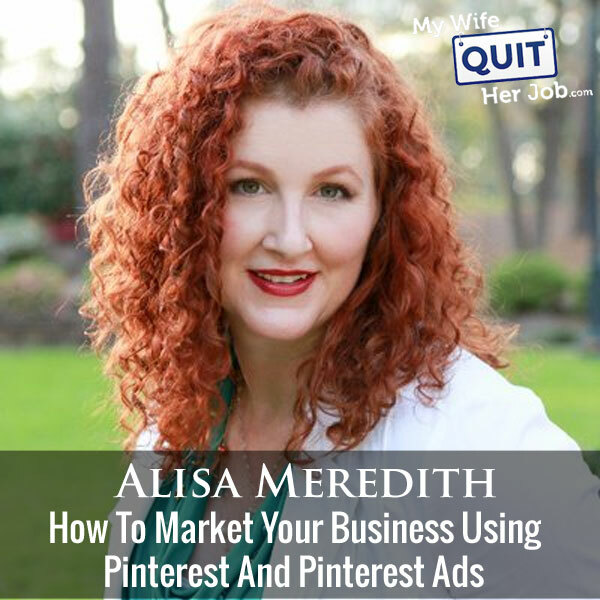 Alisa is an expert when it comes to Pinterest marketing, and today we are going to talk about what strategies are working with the platform. But before we begin, I want to give a quick shout out to Klaviyo who is a sponsor of the show. Always excited to talk about Klaviyo because they are the email marketing platform that I use for my ecommerce store, and I depend on them for over 30% of my revenues. Now, Klaviyo is the only email platform out there that is specifically built for ecommerce stores, and here is why it is so powerful. Now Klaviyo is the most powerful email platform that I’ve ever used and you can try them for free at mywifequitherjob.com/K-L-A-V-I-Y-O. Once again that’s, mywifequitherjob.com/K-L-A-V-I-Y-O. I also want to give a shout out to Privy who is also a sponsor of the show. Privy is the tool that I use to build my email list for both my blog and my online store. Now there are a bunch of companies out there that will manage your email capture forms, but I like privy because they specialize in ecommerce. Right now I’m using privy to display a cool wheel of fortune pop-up. Basically, a user gives their email for a chance to win valuable prices in our store and customers love the gamification aspect of this. And when I implemented this form email signups increased by 131%. Bottom line, Privy allows me to turn visitors into email subscribers, which I then feed to my email provider to close the sale. So head on over to Privy.com/Steve and try it for free. And if you decide you need some of the more advanced features, use coupon code MWQHJ for 15% off. Once again, that’s P-R-I-V-Y.com/Steve. Now onto the show. Steve: Welcome to the My Wife Quit her Job Podcast. Today I’m thrilled to have Alisa Meredith on the show. Now Alisa is someone who I’ve only met on Skype despite the fact that we’ve attended the same conference for two consecutive years, but for some strange reason we have never crossed paths. Anyway Alisa is the content marketing manager over at Tailwind and she is a Pinterest expert. And here is the thing, Pinterest is actually one of my top social media traffic sources, but over the past year or so I would say that Pinterest has made a bunch of changes to the ranking algorithms. So I asked Alisa to come on the show today to talk about what’s working today in Pinterest land. And with that welcome to the show Alisa, how are you doing today? Alisa: Hey Steve I’m doing all right, how are you doing? Steve: I’m doing great. Give us the background story and tell us how you got started with Pinterest and how you ended up at Tailwind. Alisa: Goodness so Pinterest it was just kind of a matter of curiosity, what is this thing. I started using it instead of using bookmarking; I would just save things there. And that’s really how people use Pinterest. So I started out as a user and then I got curious about how it could work for marketers, could it work for marketers? So I wrote an e-book because that’s what I do when I want to learn something is I write. And it started to generate some interest. I got my first client that way and I was just amazed at the traffic and even the leads that Pinterest could bring in. So I was hooked years ago. And so over time I kind of specialized in Pinterest advertising, but I am a big believer in Pinterest organic as well. I’ve always used Tailwind; I’ve always used Tailwind for my customers. So when they had this opening for a content marketing manager, I was interested because it’s a program I believe in and the people over there are really great and smart. Steve: So you actually enjoy pinning and you just do it on a regular basis even if it wasn’t for the business? Alisa: Oh yeah I do. Yeah it’s just great for planning. I have a trip coming up, so I use it, I use just a general board and then it’s a secret board between me and the friend I’m traveling with. And then inside we have board sections which is like you mentioned a lot of new things come to Pinterest and this is one of them, board sections. So inside one board you can have a section for whatever you want. So I have one for each of the cities we’re going to and all the things we want to do, then one for packing and just things I need to plan. So yeah I use it as a user which I feel like is important if you’re going to use it as a marketer to understand the mindset and to be able to put yourself in their position. Steve: Okay I mean I got to admit this to you Alisa; I’m actually not a Pinterest — like I don’t enjoy pinning. It kind of just seems like a chore to me, but I see the value because I see the traffic coming from the platform. And I actually know a whole bunch of bloggers who make a living off of just several viral pins that just bring consistent traffic to their blog. And so what I was hoping to do today, so let’s say I’m like a brand new e-commerce store owner that has a blog, what should I be doing to kind of build my Pinterest presence? Like how often should I be pinning, what should I be pinning so to automate the process? Alisa: Well first of all I just want to tell you that you are not alone. I think everyone I met at Social Media Marketing World; you know I didn’t meet you so I was meeting all the other 4,500 people there apparently. But they either said, oh yeah I use Tailwind like all the time, or I know I’m leaving a lot of traffic on the table by not using Pinterest, or I don’t use Pinterest at all but it still brings in a ton of traffic for me. That’s just a very common theme. And my hope is that over the next year or so as people start to feel the impact of the changes that Facebook or their reach is declining, traffic referrals are declining, as they start to look at other places that they’ll consider Pinterest because it is — there’s a lot of potential as you said. Steve: Yeah I do want to talk a little bit about what happened like last December I want to say, like my Pinterest traffic took like kind of like a nose dive and then it came back up. Can you just kind of comment real quickly about some of the algorithm changes that have been happening? Alisa: Yeah so they don’t really come out and say publicly what’s happening with the algorithm which no network really does except for Facebook recently right? But a lot of times what it comes down to are seasonal shifts. So what I noticed particularly in November and December was that the big brands were buying up all the advertising. So even if we weren’t competing on the same keywords, the same audiences, it’s like they just took over. So certain networks or certain industries will have huge rise in December, November and some will — it’s just a seasonal fall usually. If you compare it to the previous year you probably see some pick somewhere. Steve: Okay, so let’s talk about Pinterest strategy. So let’s say I’m just brand new, what are some of the must have things that I should be doing just starting from the beginning from scratch? Alisa: Yeah so you mentioned as a new ecommerce seller perhaps, and I’m sure you talk about this all the time about the importance of quality professional photography. Alisa: Yeah so that is going to be your foundation. And having your product photos is great and that’s good for Pinterest visual search. So Pinterest has really heavily invested in what they call lens which allows you to like click, take a picture of something on a street and then Pinterest will match it to photos in their inventory. Or take a picture of your outfit and Pinterest will match it to other similar outfits, or one piece of clothing, it will match it to another for you. So if you have photos of just like a straight product shot, that can be good for getting found that way. However, the photos that translate into sales are the lifestyle photos. They actually convert to sales at 170% the rate of a product photo. Alisa: Yeah so you’re going to want those lifestyle photos. And illustrations I’m sure everyone who’s ever heard me talk is sick of hearing, but it’s so true. It’s very much like when you’re selling your house; you’re staging it for a showing. Your real estate agent will tell you to okay paint over that fluorescent green wall, take down all your family photos, anything that is just too personal and so the people who are coming through can picture themselves and their life, and their family in your home. That’s the kind of the way you need to think about your Pinterest images. So Pinterest doesn’t really favor faces so much like Instagram is loves faces, can’t get enough. But on Pinterest you often see even fashion shots where you have a person in the outfit but a lot of times they’ll be cut off at about from chin level, you’ll only see chin level down. And that’s why because people are planning for themselves when they’re on Pinterest. They’re not looking to see how you look in that outfit, they want to picture themselves. Steve: Interesting, so you actually don’t want to put any faces in, which is completely different than the way Facebook works? Alisa: Yeah I should say I mean Instagram also loves faces, but Pinterest I mean you can definitely try it. I would try to try everything right, experiment away. But in general faces don’t do great. If you could have a slightly turned away, or wearing big sunglasses, or just cut off at a certain point, that helps a bit. But you definitely want those lifestyle images. Steve: Does that imply like every store should have lifestyle images that are longer rather than — that are tall rather than short? Alisa: Yeah so when you go on Pinterest it’s pretty clear to see what stands out. They say those taller images look better in the feed; they take up more room, and especially on mobile that’s going to be really important. So the suggested ratio hasn’t really changed, but the size Pinterest is giving right now is 600 by 900 pixels is good. You can go up to about 600 by 1500 before you start getting cut off in the feed. Steve: Okay, I think — I have a Pinterest assistant too who does all my pinning and she was telling me that everyone should be doing 1,000 by 1,500 pixels, is there any merit to that or? Alisa: Well that’s kind of the same ratio, right? Steve: Same ratio but resolution wise does it help to have high resolution images? Alisa: No Pinterest actually suggests 600 by 900. Alisa: I don’t think you need to go any bigger than that. It’s not going to hurt but you don’t have to. Steve: Sure, sure okay. So every product on the store should have its own six by nine images? Steve: Okay better than lifestyle. Alisa: Yeah and two, you might have noticed that descriptions are not as prominent anymore in the feed. So it used to be that you would see the image and you would see the rich pin data which is the information that Pinterest pulls from your website. So it comes up as a like a bolded headline and then you see the description underneath, but now we’re not seeing that. So sometimes we’re just seeing rich pin data on occasion, we don’t see anything but pictures. So that makes it more important. If it’s not really obvious what your product is now with e-commerce sellers, it’s probably a little more obvious what the pin is. But if there’s any doubt about it, you want to add some text on it because people are not getting the extra context with the description like we used to. Steve: Interesting okay. So are you implying then that we should put the name of the item on the photo in addition to maybe the price or not the price? Alisa: No I would instead use rich pins because that pulls the pricing in from your website so you never have to worry about data pricing being out there on Pinterest. And if it’s obvious what your item is, right, so if it’s linens I mean it’s pretty obvious what the pin is about. Alisa: But if it’s not text overlay can be great or if you’re doing a collage image which can be a great idea to have more than one item in a pin because it attracts a wider variety of people to that pin, then it might be helpful to have some text overlay. But all you have to do is just go to Pinterest and do a search for whatever it is that you’re going to be sharing. You get some ideas about what might be some affective text on the image. Steve: Any tips on what to write in description? Alisa: Yeah so your description should kind of tell a little bit of a story, but it also needs to be keyword conscious. Not keyword stuffing and not just listing your keywords but working them into the description really works, because Pinterest is a visual search and discovery engine that has its own SEO formula. And part of that comes from the description that you write, so it’s important to include that. I actually got a J. Peterman catalog in the mail certainly and those are kind of hilarious but that’s kind of on the lines of the sort of thing you want to write. If I see a pin that has a description like I made this dinner for my family and even my kids loved it, that’s the kind of description that works on Pinterest. Steve: Interesting okay. So, not just a description of the product, not on the doorstep but just something catchy. Alisa: Yes something catchy. And also another change that came to Pinterest this year were hashtags. So I don’t know, have you noticed that? Steve: No, no tell the audience about it. Alisa: Okay so for years Pinterest said hashtags don’t work on Pinterest, don’t use them they’re confusing. And then they said; okay, now they do. So the way it works is there are now two different ways to search on Pinterest. We have a smart feed which is Pinterest algorithm which is dependent on things like pinner quality, material quality, the popularity of the pin, so many factors that many of which we don’t even know. But then there’s a second search method which is purely big. So when you use a hashtag in your pin, it will show up in a hash tag search if anyone’s doing hashtag searches on Pinterest. I don’t really know how common that is but it will also work if someone has put a tag in the description of another pin to pull up your pin. There are some limitations to it. So it only works on pins not re-pins. So if you save a pin from Pinterest and add a hashtag, that won’t show up in hashtag search. It has to be something you pin yourself originally from a website. And the other thing is [inaudible 00:15:07]. It’s the most recent fresh pin. So if you look at a hashtag search feed, you’ll see. It starts out this board was pinned five minutes ago, this one ten minutes ago and down and down and down the page they get older and older. So hashtags are a really great way to get your newer content surfaced more quickly, whereas the smart feed can sometimes take a little while for your pins to get into. Steve: Can you define what those are? Steve: Using the Smart feed versus the hashtag feed. Alisa: Yeah so the smart feed is based on Pinterest search algorithm which looks at your quality of your pins, your account quality, the popularity of the pins, the engagement of the pins, all kinds of different search factors. So when you pin, all your pins don’t go out chronologically. So you when you look at your feed, this is not a feed of just everyone you follow and their pins chronologically. It used to be that way quite a while ago. Alisa: Now it’s much smarter. So Pinterest will kind of drip out your pins over time to start, will see how people are engaging or not with your pin and decide how much to show it, how quickly and to whom they want to show it. So that’s a big complicated thing, and the best we can do is just pin the best we can pin at the best times which we can go into in a minute. But then with hashtags searching, I feel like we have a little more control over how those do. Steve: Okay and you found that that’s been working pretty well? Alisa: Yeah I haven’t actually done a lot of analysis on it and I have someone coming on the Tailwind Facebook live coming up pretty soon to talk about that because she has done. But I feel like any kind of advantage we can get to get our newer content out sooner, I’m going to take advantage of it. Steve: So you mentioned that the higher performing pins based on engagement tend to do better, so is there something that you do to test whether a pin is going to do well before you actually pin it or do you just pin it and if it does well you let it ride, but if it doesn’t do well do you pull it or do you just always leave it? Alisa: No I mean there are people out there who encourage you to delete pins, but I feel like that’s a waste of time. It’s also can hurt you because I have had pins that have done nothing, nothing, nothing and then three, four, five months later all of a sudden they take off. So I feel like our time is better spent creating new content to share as opposed to going back through and deleting pins that don’t work. Yeah but as far as like how to get those pins more engagement, it does matter when you pin because it’s kind of like how I understand the Instagram algorithm works. They start to kind of drip it out and then if you get good engagement at the start, then they will really kind of release the floodgates and let your content be seen by more and more people. So with Tailwind and Tailwind is a Pinterest and Instagram scheduler, what it does that’s unique, it has a smart schedule. So it looks at your pinner, what you pinned and your followers, when they are most likely to be on the platform and engaging and suggests those times for you to pin, which means that your pins have a greater chance of that upfront engagement which means that they should be shown more in a smart feed over time. Steve: I see oaky. And in terms of pinning frequency, so let me back up real quick. So let’s say you have product pins and you have like blog post related pins, like at least for me I found that the blog post related pins always do better. Is that the case of what you’ve see as well? Alisa: Oh yeah definitely. So people go on Pinterest to discover new things, right? So 93% of pinners say they go to plan purchases. But the thing is they are starting way ahead of time. So it may be three months before they’re actually ready to make a purchase. So what they’re really looking for is something that’s inspiring and useful, and beautiful. And then later on they’ll be more open to those product pins. But Pinterest is unique in that you get to reach them up higher in funnel. 97% of those searches on Pinterest are non branded which is a great advantage for the smaller brands, for a new e-commerce seller who people aren’t looking for their brand, they’re just looking generally for what they offer. But Pinterest really has a pretty even playing field as far as that goes. Steve: Okay so does that imply then that people need to have a blog with their store to be a little bit more successful with Pinterest? Alisa: I kind of always felt so, but I’m not sure it’s practical for everybody. So I think that you can kind of compromise if you need to. So what you could do it and if you look on Pinterest, Target does a ton of advertising on Pinterest. So I look at what they do. They have one pin out which is two different dining room sets. And if you click on that pin, it goes to a category page which is dining room sets. And I think that’s really a smart way to bring in a wider audience and give them an easy way to purchase. But what you could do which would be like a little more towards a blog side of things is you could create, it could be like a product page but it would have your lifestyle image so you’d have several products in it. And then on that page you could describe what it is, what this is good for like whether it’s great for spring time branches or baby showers or whatever kind of entertaining you’re trying to encourage there. And then you could have or easily linked to all those products so they can purchase each one separately. Steve: So kind of like a custom landing sales page of sorts? Alisa: Yeah somehow like 1,000 word blog post because we’re not trying to rank on Google, we’re just trying to have a good place for Pinterest traffic to go so that they feel like, hey, we’re still getting some other inspiration, some other idea and actionable tips but it’s also an easy way for them to purchase. Steve: Okay so with a brand new account like how does one build the account because the account strength matters a lot right in terms of the visibility, yes and no? Alisa: I mean yes and no. So you can get clicks on your website without even having a Pinterest account which a lot of people can attest to because there’s other people pin your pins and stuff, traffic starts coming. But I do recommend you start out with a strong strategy. So create a good profile and optimize profile using your keywords intelligently, and plan out your boards because once you start down that Pinterest rabbit hole things can get out of control really fast. Steve: What are some best practices? So first of all you mentioned choosing the right keywords. What exactly does that mean on your account? Alisa: Okay so when you are choosing your name, so mine is something like Alisa Meredith Pinterest marketer and content creator or something like that. So those keywords matter and your description matters as well, your board titles matter. Board descriptions are good practice, but I’m not seeing that they matter so much in search. You can do keyword search and look at just boards, and pull them up and half the time they have no description. So I mean I will say like whatever little advantage you can take, take it but I don’t think that matters too much. But then keywords in your images like the images on your website of course you want to have them and you know this from optimizing for Google. You don’t want 123.jpeg. Alisa: You want embroideredlinennapkins.jpeg. That matters on Pinterest as well and also the content on your site. Pinterest will look at that as far as figuring out what the content is. Steve: Oh so Pinterest will actually crawl your site to see what the general theme is? Alisa: Well they would like to relate your pin. So the way we can really see this in action is when we start promoting pins. Pinterest will allow you to dynamically target ads. And what that is, is Pinterest analyzing your pin and choosing the keywords for you. It’s fascinating. They won’t tell you what keywords they’ve chosen which would be really interesting if they would. But it’s based on number one; it appears to be the image you use. So if I’m going to use dynamic targeting, first I’m going to look at that image on Pinterest and see what Pinterest matches it to. So if you pull up a pin, it will say underneath it more like this and it will show you what it thinks your pin is like. So that is a really good way to tell how Pinterest sees your pin. Steve: Interesting okay. So let’s back up a little. I want to talk about promoting pins in a little bit, but for now I just want to focus on the organic. So would you start out by just pinning your own products, like what is the general strategy like should I pin other people stuff, should I be re-pinning more, like what’s the ratio? Alisa: Oh I’m not a fan of ratios because I feel like people feel like it’s a rule. But I think it can be helpful for people who just like tell me what to do. But they’re lazy ones. So it kind of depends on how much content you have. If you have years and years of backlog content and you’ve never pinned any of it, well then you don’t really need to pin that much of other people’s stuff. But if you’re just starting out, you’re going to really need to fill up your Pinterest account with some other pins. But in either case you do want to pin other people’s content because as you’re pinning really great quality content which people will engage with, that will also start to bring your pins up higher in search. Steve: How does that work? So and I’ve seen other people’s accounts, they do this beautifully. They have different boards, different categories and then they pin beautiful images in each one of those categories. And then they have this really filled board, does that actually matter? Is it because people are looking at your board to determine whether they want to follow you or not or? Alisa: Well most of the activity that happens on Pinterest now happens in search. So some people really care a lot about having board covers. Well I don’t think that’s a great use of time generally because for one thing it’s always changing and it is hard to figure out what to use. For another thing people will know they’re generally not browsing people’s Pinterest accounts, they’re searching. But as far as pinning other people’s content, I recommend everybody have at least one board that has just your own content on it. So I have one for myself that’s only articles I’ve written. Nobody else has a board like that, I can guarantee you. And those boards tend to do really, really well and part of that I think is because most of the content on Pinterest are re-pins, and my board there is unique. It’s only you know it’s pins. But as far as everything else goes, you probably can’t create all the content that your ideal customer is looking for on Pinterest. So you can create boards like multiple boards that would fit your content, you can have boards that are very similar in title and even similar in content. And Pinterest does not have a problem with duplicate content. So you could pin your pin to 15 different boards as long as it’s relevant. And in fact that is encouraged because it teaches Pinterest what your content is about. So I have a pin on my Pinterest board and then I have a pin on my visual marketing board, and I have that same pin on content marketing board that starts to teach Pinterest what it is. Steve: I just want to take a moment to tell you about a free resource that I offer on my website that you may not be aware of. If you are interested in starting your own online store, I put together a comprehensive six-day mini course on how to get started in e-commerce that you should all check out. It contains both a video and text based tutorials that go over the entire process of finding products to sell all the way to getting your first sales online. So what’s a little confusing to me is it seems like the performance of your pin really matters right, how well it does in a certain timeframe once it’s been pinned. So does that imply that your own boards can just be like a hodgepodge of stuff, like it doesn’t really matter anymore, it’s just really all about the quality of the pin? Alisa: You mean a hodgepodge as far as whose content it is? Steve: No not whose content it is but the way you organize it on your own boards, does that even really matter? Alisa: No it doesn’t because really people are looking, they’re going to find you through search most of the time. Steve: Okay so really when it comes to like organizing your own boards that’s really just for you, it has nothing to do with ranking, right? Alisa: Yeah so I mentioned before that I like to use board sections in my private boards. So I might have a real general board and then break it down inside my board with board sections. But those board sections do not help with your SEO. Yeah, so people have asked, well does that mean I can just create one general board for marketing and have inside of that one for social media and one for blogging? No, you want to keep your board titles and themes very specific. Steve: And that is to teach Pinterest how to categorize your pins? Alisa: It has to be relevant and you can do things like joining group boards can help get your pins in front of new people as well. There has been some talk that the group boards aren’t effective anymore, but I’ll tell you when I do an audit on somebody’s Pinterest account, usually I use heroin [ph] for that and I look at the board insights, and it will give you like the variety of the board and engagement of the board. And almost always one of the very top highest performing boards is a group board. And then also on the other hand the group will usually be one of the worst. So it just depends on the group board whether it’s active, whether what’s being pinned there get pinned, whether they’re relevant, whether the pins lead somewhere where they’re supposed to or not. Steve: So what is the strategy to get traffic then? Like if you’re just pinning your own stuff, that’s obviously not going to lead anywhere, right? You have to get followers and you’re to get on a group board, what is the overall strategy for traffic? Alisa: Well again most of what’s happening is through search. So if somebody searches for embroidered linen napkins, you want yours to come up, right? So followers — I mean if you look at your home feed and you click on the little three dots next to the image or below the image, it will tell you why that pin is there. And you’ll see some are there because of a board you follow, right; so that means okay you do kind of want followers. Some are there because of other things you’ve engaged with, some are promoted and so on. So there are a lot of factors that go into why you see what you see in the home page. But again most of what you’re doing is searching. So when you search, you can see pins from anybody. Steve: So how do you rank yourself in the search algorithm too? Alisa: So you pin lots of great stuff. Steve: Interesting okay, so it’s all merit based at this point like there’s no — like in Google land you can game it somewhat by getting back links and whatnot. How does that work in Pinterest land? Alisa: I mean there are probably people who hack things and I know there are people who will take other people’s pin’s and change the URL which is bad, bad, bad and we would never do that. But basically create beautiful content, create beautiful and engaging content that is helpful to people. So one of Pinterest big things is get off the platform and go do it. So they really are very generous with the traffic that comes from Pinterest to your website, but it’s up to you to entice people to want to click. Steve: So, there’s a number of people that pin and pin, that obviously affects the search rankings, right? Alisa: Yeah it seems to, now it’s interesting that this year they removed from desktop where you used to be able see how many re-pins a pin had. And the reason for that they came out and told us and I’m paraphrasing but basically they don’t want us just re-pinning because something is popular. They want to give all the content of a good content a chance to rise to the top and not just be sharing what people are sharing because it’s popular if that makes sense. Steve: Yeah I know it does, it does. So from what I’m hearing at least it seems like you just pin your own stuff, you can get by just pinning your own stuff and if it’s good it’s good, if it’s not then it will get buried. And I don’t actually see the point in pinning other people’s stuff if your primary purchase on Pinterest is self promotion. Alisa: Well except that if you’re printing other people’s stuff — I mean if your stuff is the best content in the entire world, most beautiful pins that ever were created and you can create an endless amount of them, you can get away with only pinning your own stuff. However, most of us can’t do that. Another thing I like to look at is inside Pinterest analytics, you can look at the people you reach section, and there’s a section there on interests. And that will show you. You can sort it either by people who follow you or just everybody who sees your pins and see what else they’re interested in. So I almost always there’s going to be people interested in quotes. They’re usually interested in DIY, food, but other things are going to vary by account. So if you go in there and you find, okay, my followers are interested in motivational quotes but I don’t really do that. There’s still value in creating a board even if none of your content can’t get on there and then pinning other people stuff to it, because that will encourage Pinterest to then show your other pins to those people who are interested in that board as well. Steve: In search you mean? Alisa: Yeah in search or even in the home feed. Steve: I see. So when you say followers though that implies it is important to get followers because those form the basis for your search rankings? Alisa: No, no search rankings are not dependent on followers, at least not that we’ve been told. So in that dashboard I was talking about, you can either look at the interest of your followers, or the interest of people who see any of your pins. And those people who see any of your pins are those who are also finding it through search. Alisa: Yeah so I feel like almost nobody can fill all those interests with their own content, but there’s still value in pinning that or having a board for that. Steve: For your followers primarily, right? Alisa: Or for anybody who sees you in search because that is showing that those people who are interested in your content are also interested in this stuff over here. So then pinning this stuff over here will bring your other stuff more to their attention as well. Steve: I see, so if they’re searching for quotes and they see a quote then they just see a pin for one of your posts, they might go and browse. Alisa: I mean and it’s all very unscientific obviously but this is just kind of what we’ve learned from how we’ve seen things work and from the times that they do tell us how things work. But it really it kind of it teaches Pinterest, okay, this person is interested in this, they have also seen your pins on here so let’s share more of your stuff to them even if they’re not following you. Steve: Interesting okay. This is like a complicated thing to explain. Steve: Well let’s switch gears to promoted pins. So you can buy these keywords in search and have your pins show up, right? Steve: So how would one use that for physical products? So one you mentioned before that sometimes people plan ahead and they don’t actually make the purchase until three months later, right? Steve: So does that imply that if I’m buying pins right now, there could be a substantial time frame before a sale? Alisa: Yeah exactly. So, this is one of the challenges I think, for people who are starting out with credit pins is to understand that your sales cycle is going to be considerably longer than most other platforms. So if you sell using Facebook ads and you find that usually the conversion starts to peak at about two weeks, you’re going to count on at least double that for Pinterest. Yeah, but there are ways to track conversion. So it takes a little bit of either custom coding or a special plug-in but you can actually track things like add to cart or sign ups and purchases right in the Pinterest provided pin dashboard which I find incredibly helpful because then you can see exactly which ad is working, what targeting is working to really result in a purchase. Steve: So what are your strategies for setting up promoted pins and how does this differ from like in AdWords for example? Alisa: Well you may have to tell me because I haven’t done AdWords in a very long time. I do know some people who come over and want my help with Pinterest promoted pins; they kind of want to recreate their Facebook ads, which is not entirely possible. But there are some other options which I don’t think anybody else has. So when someone comes to me and wants to promote something, we’ll usually start with just a couple of products because each campaign will be for that one product. So can you give me a product that you might want to promote? Steve: So let’s say I have like hundreds of styles of handkerchiefs, I would have to choose one of those, is that what you’re implying? Alisa: Okay, well here is a budget friendly idea. If you had maybe six of them that were so like had a certain theme, like they were good for springtime weddings, you could create a pin that had all six of them in one pin, and then you can promote that. Steve: Like a collage you mean? Alisa: Yeah, yeah so let’s do that because that way you can try out promoted pins on a bunch of products but in a kind of a way that won’t break the bank. So this will be one campaign, it will be our [inaudible 00:38:04]. In that one campaign we’re going to have many ad groups. So I’m going to have an ad group for different kinds of targeting. We have audience targeting, so I would create one that was a visitor audience target. Steve: Basically add anyone who’s been to my site? Alisa: Yes. But then we’d have a talk about okay does it make sense to target everybody went to your site or should we just target people who went to those six pages for those six handkerchiefs, or should we go for a category of pages. So we’d have to figure out like what pages or visitors who we really want to target. So then we would also look at your e-mail lists and see if it made sense to target any of those. And then we would think about okay are there pins already out there that we would want to target people who would engage with them? So let’s say I go to your website and I find spring handkerchief number three, and I pin that product page myself. And then my friend Tina sees my pin and she saves it. Now you Steve can create an ad and target Tina because she saved that pin that I pinned of your product. Kind of crazy, right? Steve: Yeah. So what you describe basically is traffic that I already have. What about like top of funnel stuff, how would you set that up? Alisa: Oh no but that third one there, I mean she has never been to your website Tina. She clicked on my pin to go see your website, or she saved that pin but she hasn’t been there yet. So you can now target anybody who has just saved that pin that goes to that website. Alisa: Yeah so that’s a really great way to get some cold traffic. You can also once you’ve run those three audience campaigns; you can look at what works really well. But maybe if you have a smaller audience size anything under 100,000, it’s kind of hard to get scale. So then what you want to try is an act like audience. So any of those other audiences you created if they’re working well, you can create a one to 10% match act like. So that Pinterest will look at your original source audience and then try to match it to other users who it’s not a lookalike like Facebook will look at demographics, job titles, whatever, Pinterest really tries to look more at their pinning activity, and what they are interested in. Steve: So, based on what they’re searching for? Alisa: Based on what they’re searching for, what they click on, board titles that they themselves may have created. Steve: Okay so these are audiences and at the same time you’re picking keywords, right to bid on? Alisa: Well you don’t have to, you don’t have to. So that would be reaching everybody on those audiences. Now if you found like especially if you had an act like that maybe wasn’t converting really well for you, you could add on top of that keywords. Steve: Interesting so when you don’t use keywords though, what is there – yeah just to everybody but that includes blog posts and products, so how would you distinguish between the two? Alisa: Well it’s like if you were going to do the visitor audience, you could say all right I only want to do people who’ve been to this blog post, or I only want to do people who’ve been to this product but not that blog post. You can get really specific about how you create your audiences. Steve: So is that how do you recommend people start with their own audiences without any sort of targeting just to get those people back? Alisa: Yeah. And but I also — so this is why we start with just a few products because inside my campaign I usually have eight plus ad groups. So right now we have four, but we could have more. So we have four, we have the visitor audience, we have the customer audience or your email list, we have your engagement audience, we have your act alike. So then we can move on to other things like interests. So Pinterest has 7,000 preset interests that you can target. And an interest is Pinterest is trying to get inside of our heads and figure out what it is we are interested in. So it’s really kind of comical when you start to look at the different interests. You can target things like dogs. Okay well that kind of makes sense, but you can also do field tracks, man burns [ph], javelin throw, stretch marks. So, you might be like, oh I’m not going to have mine, but they have some pretty interesting ones. So you can target any of those that you want and they can work really well if you find one that’s not super popular. So what happens is you can imagine when you do keywords it’s an unlimited number of combinations of keywords you could bid on. If you’re doing interest, it’s only 7,000. Obviously the competition for each is going to be higher so they can be really expensive. But then you have keywords so you can do broad match keywords which actually, this is kind of an interesting one. And I was puzzled by them when I first started running them because I would export my data on my promoted pins and looking at the placement like where were these pins showing up on Pinterest. My broad match keyword ads were showing up in people’s home feed. And I said to my ad assistant what in the world is this, I’ve only targeted keywords, why is it showing up in home feed, they haven’t searched. It has nothing to do with search. It’s really just like create your own interests. That’s what broad match keywords are. Steve: Okay, that’s really bizarre. So, along those lines then, so if you’re using like exact match on the keyword level, could what happened to you still happen then? Alisa: No. So we have interest, we have broad match keywords. And now yeah we have keyword and phrase match keywords. I mean exact and phrase match keywords. When you use those together or each separate, you will only reach people when they search. So I had a feeling that they would convert a lot better, so I ran a test. I had 74; I had two sets of 74 identical ad groups. And one set of 74 I targeted with a broad match type targeting and the other was phrase and exact. And the phrase and exact converted at 60% higher to sales which makes sense because they’re not just browsing, they’re actually looking for what I’m selling. Steve: Okay. I’m leaving with more questions than answers Alisa. No I’m just kidding. Yeah you know Alisa I don’t even think we can fit this in an entire episode because yeah it just seems like Pinterest has fundamentally changed a lot from like the last one and a half to two years. Alisa: Maybe, but you know what, the principle still apply. So inspire people, meet them where they are, where they are on Pinterest is not a social network, they’re not going there to impress anybody. They’re going there to be inspired to play in and to become a better person. Steve: So if we were to just kind of sum up everything we’ve talked about like at least on the organic side, it seems like you just want to be pinning the best pins, that you can organize your boards based on the keywords that you want to select, pin other people’s content based on the interest that you’re seeing that your followers are that you don’t have content for, and it doesn’t really matter at this point whether you have a large follower account or group boards. You just want to be pinning the best stuff out there, and let Pinterest kind of decide what’s going to flow to the top in terms of search. Alisa: Pretty much yeah, although I would add that I do pin other people’s stuff aside from what I can create myself. So if someone has pinned an article a great article about Pinterest, about Pinterest promoted pins, I will pin that because I feel like and I know that if it resonates with my audience which is anyone who sees my pins not just [inaudible 00:46:24], that increases my clout on Pinterest for all of my pins. So it’s like that rising tide raises all boats thing, it’s a nice thing to do to share with people, but it also helps you out as well. Steve: And in terms of like the number of pins, in terms of visibility, there are purposely hiding that to level the playing field. Do you find then that the pins that you see on the front page or in your feed have like a wide range of pins on them? Alisa: Yeah so when I look at my home feed now, sometimes I see pins that are really recent like within the last week or so. So that’s encouraging to me that it’s definitely not too late for anybody to get started on Pinterest. Steve: Okay and in terms of ads, you recommend starting with the audiences that you already have and then gradually reach out because you can reach people that have already pinned your stuff that are not familiar with your brand to start out doing that and then gradually move over to interests which tend to be more expensive followed by keywords? Alisa: Well you know what I start them all at once because usually the people I work with have a smaller audience. So anything under 100,000 again is pretty small and hard to scale. So I find that we need to reach out to those colder audiences using keywords especially phrase and exact match. The other thing is when you get sales from Pinterest promoted pins, 70% of those people are new customers. So that’s telling you that you’re probably going to have to reach beyond your own audience. Steve: Okay. OK well Alisa we’ve been chatting for quite a while. Thanks a lot for the overview of Pinterest. Steve: Yeah thanks a lot for coming on the show. And if anyone wants to find you or your content, where can they find you? Alisa: Well I blog over at Tailwind, so blog.tailwindapp.com, and I highly suggest that if you’re looking to save time on pinning because we didn’t really get into numbers, but you know you could spend a long time pinning, you do you want to schedule and you also want a stream of updated content to choose from. So I suggest Tailwind and Tribes. But if you want more promoted pin information, that’s my blog Alisameredith.com. Steve: Okay and we didn’t even talk about what Tribes are. Are Tribes essentially what is replacing group boards in your opinion? Alisa: Well, I mean group boards is part of the Pinterest platform. Tribes is on the Tailwind dashboard, anybody can use them though. So what that is, is like a group of likeminded bloggers will put their own content in and then share other people’s out, and so you can see like what kind of reach you got and how many pins and re-pins. There’s a chat function in there, so I’ve discovered a whole bunch of really great bloggers I never knew existed because of Tribes. And I almost exclusively pin for my Tribe now because I don’t have to check the links when I’m — when you’re pinning on Pinterest, you’ve got to check and make sure the link is good because you don’t want to be linking to spam because you get reported, it will hurt you. But Tribes always has very good content. Steve: So Tribes are basically groups of collaborative bloggers or content producers, right? Steve: Okay cool. Well Alisa thanks a lot for coming on the show, really appreciate your time. Alisa: Thanks Steve, I enjoyed it. Hope you enjoyed that episode. Pinterest has undergone a bunch of changes in the last year and I thought Alisa gave a great overview of what it takes to succeed on the platform today. For more information about this episode, go to Mywifequitherjob.com/episode210.